California girls don't understand seasons. Even if we've long said inane things like, Oh, Autumn is my favorite time of year! Even if we've once or twice strapped a snowboard to our feet and slid down a mountain on the backside of our rented coveralls. Even if we know all the words to the current summer pop hit. California is a special place, a magical place, a place where temperatures just don't vary much. Especially in the south, but even in my own beloved East Bay. I spent the first 28 years of my life spoiled rotten by mild winters, early springs, hot, clear summers, and autumns that didn't require me to put a jacket on over my Halloween costumes. So you can imagine what an adjustment it's been to move to Norway. Land of four seasons. Winter. Rainy spring. Raaaaaainy summer. And a dark, chilly autumn. I'm kidding. It's not that bad. And actually, I've enjoyed the seasons so far. Seasons are pretty. Who knew? 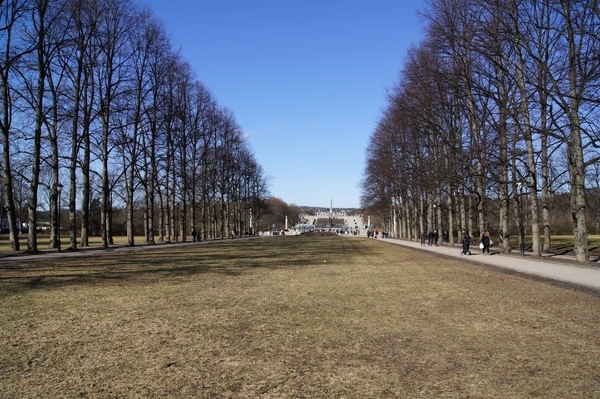 This is best demonstrated by looking at the changing seasons in Oslo's Frognerparken. 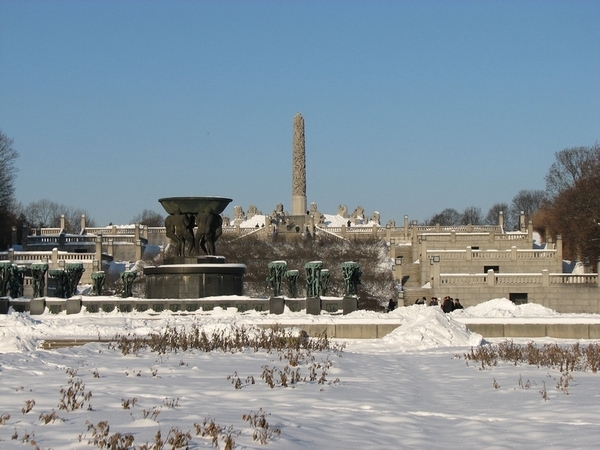 One of Oslo's most recognized landmarks, Frognerparken (which includes Vigeland Sculpture Park) covers 80 acres of grassy space, with more than 200 bronze and granite sculptures on display, all of them by Gustav Vigeland. 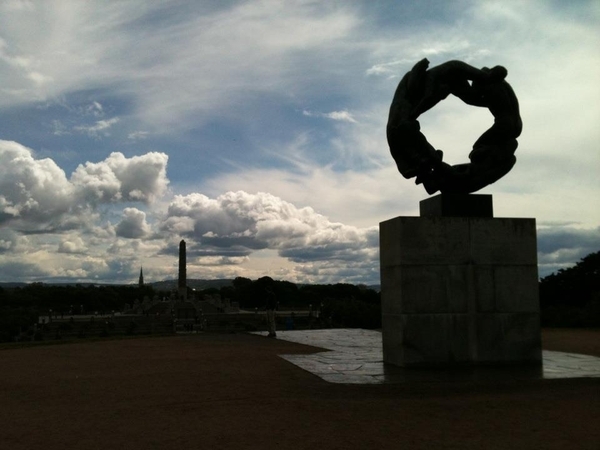 The Norwegian sculptor donated these statues to the city and park in return for receiving a free studio space in Oslo. Upon entering the broad iron main gate at the southeast end of the park, visitors can walk straight down the main path across a 100 meter bridge lined with the statues, all nudes. They are gray and polished to a shine at every curve. The figures dance, embrace, wrestle, make love, and die, all along the bridge, all around a grand fountain, all leading to the main attraction: The Monolith Plateau. The monolith rises more than 14 meters into the air, appearing as a totem that includes 121 human figures entwined and clambering toward heaven. 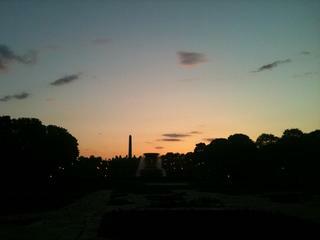 A great place to run, bike, walk your dog, Frognerparken is popular with tourists and locals alike. People watching there in the summertime is great fun, especially on those long, warm summer evenings (we've had at least three of those this year), when everyone in Oslo spreads blankets out on the flat grassy spaces around the monolith, watching the sun in its shallow setting pattern, turning the sky every shade of pink.